Hosted by the Chilean Antarctic Institute’s Director Dr. Jose Retamales, on 31 January 2011 a delegation of officials from the Ministry of Foreign Relations visited Puerto Williams, capital of the Chilean Antarctic Province, as part of a national initiative to re-evaluate and strengthen ties in research, logistical support and tourism between the Magallanes and Chilean Antarctic Region and the “white continent”. For these reasons, Assistant Secretary of Foreign Relations Fernando Schmidt, the Regional Intendenta Ms. Liliana Kusanovic, and the Governor of the Chilean Antarctic Province Mr. Nelson Carcamo led a group of ambassadors, authorities, scientists and tourism entrepreneurs to the world’s southernmost town. Mr. Schmidt, who 25 years ago was the Chilean consul in the city of Ushuaia (part of the Argentine portion of Tierra del Fuego), was extremely content to return to these high austral latitudes and expressed his surprise to see the great changes that had taken place in the interim, including the construction of the new Martin Gusinde Anthropological Museum and the creation of the Omora Ethnobotanical Park. The delegation was received at the Omora Park’s new Cape Horn Field Station by Dr. Christopher Anderson, Coordinator of the Sub-Antarctic Biocultural Conservation Program (SABCP). There, Dr. Anderson discussed the importance of the investment made by the Millennium Scientific Initiative (Ministry of Economy) and the Basal Financing Program (CONICYT) to achieve the construction of this landmark and the fact that this achievement had been made possible due to the support not only of major national programs, but also the institutional alliance of the SABCP created through the collaboration of the Institute of Ecology and Biodiversity, the Universidad de Magallanes and the University of North Texas, among other partners. At the same time, the group discussed the next phase for the research, education and conservation agenda for the sub-Antarctic archipelago and its links with Antarctica through the building of a Cape Horn Research Center. This project has already received the support of renowned architects, including the firms involved in the building of Latin America’s tallest building in Santiago, as well as the Clinton Library in the United States. In the short-term, it is expected to develop the design of this project in 2011, to begin construction in 2012 with the support of the regional government and national and international partners. 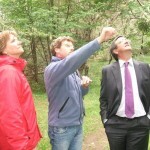 Afterwards the group toured the Omora Park, where the delegation was able to appreciate Cape Horn’s unique biodiversity as well as the new trail infrastructure made possible through the INNOVA-CORFO project entitled “Ecotourism with a Hand Lens”. At the Park, researchers and students from Chile, Spain, Argentina and France demonstrated to the authorities the power of the link between academia and society being developed in the park. For example, a group of Spanish lichenologists from the Universidad Complutense de Madrid, who are operating long-term research project in Antarctic and at the Omora Park, indicated to the delegation that Cape Horn is like the canary in the coal mine regarding global change. What happens in terms of global warming is happening here first, before even Antarctica. For that reason, these scientists are working in the high-Andean sites of the Omora Park and simultaneously on the Antarctic Peninsula. Similarly, authorities and students working with the regional invasive species control program, coordinated by the Chilean Agriculture and Livestock Service, demonstrated how scientists from the Omora Park are interacting with decision makers to implement practical policies such as the control of mink and beaver in the Cape Horn Biosphere Reserve. In turn, the assembled group of graduate students also conversed with Governor Carcamo the importance of the continuous education program led by Omora Park that brings together world leading scientists with graduate students from the regional and other universities and teachers and students from the local schools, integrating science and sustainability issues into the formal and informal education activities in the Magellanic sub-Antarctic ecoregion. The University of North Texas’ Center for Adult and Lifetime Learning (CALL) selected the Cape Horn Biosphere Reserve as one of its first ‘Travel Learn’ trips. 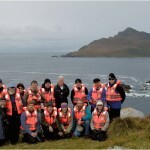 From 7-16 January, these intrepid travelers visited the Cape Horn Biosphere Reserve aboard the Stella Australis, landing in major world heritage sites like Cape Horn Island and Wulaia Bay, where Darwin and Fitz Roy encountered the Yahgan tribe. The Travel Learn team was joined by 10 researchers and colleagues of UNT and UMAG, including Dr. Claudio Wernli, executive director of the Millennium Scientific Initiative, which is a major funding source for the recently inaugurated Cape Horn Field Station. Hosted by UNT Provost Dr. Warren Burggren, this trip provided participants a unique and close up look into the ecosystems and biota and also the important research being pioneered by the alliance of institutions led by the University of North Texas, the Universidad de Magallanes and the Institute of Ecology and Biodiversity. 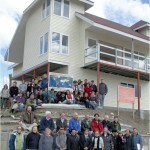 An alliance between the Universidad de Magallanes, the Institute of Ecology and Biodiversity, the University of North Texas and several U.S. and Chilean non-profit organizations has opened the world’s first environmental philosophy, science and policy field station at the southern tip of Chile in the village of Puerto Williams. The new Cape Horn Field Station supports an international network for interdisciplinary environmental research opportunities for faculty, students and affiliated research scholars, helping to place UNT’s work at the forefront of conservation and study in the Cape Horn archipelago. The research cluster and program has worked to integrate ecological and social aspects of research, education and conservation into a long-term research, education and conservation program. The program’s unique integration of the sciences and ethics with an emphasis on ethno-ecology and environmental philosophy coincides with UNT’s doctoral program that focuses on environmental ethics and philosophy. Students, scientists, government and university officials, and visitors attended the inauguration, including officials from the Universidad de Magallanes and the Institute of Ecology and Biodiversity, UNT Provost and Vice President of Academic Affairs Warren Burggren, UNT Vice President of Research Vish Prasad and Edgar Muñoz, Commander of the Beagle Channel Naval District. Nelson Carcarmo, Governor of the Chilean Antarctic Province presided over the ribbon-cutting ceremony. The two and a half story facility has a kitchen, library, classrooms, computer area and laboratory for processing and storing research samples and other field equipment. The station also provides office and lodging space for up to 15 students and researchers during courses and expeditions in the Cape Horn region. Previously, research activities were based at a Universidad de Magallanes-owned facility in Puerto Williams that housed six people. The new research facility sits inside the UNESCO Cape Horn Biosphere Reserve, a pristine ecoregion with mountains, glaciers and forests that offers a rich environment for ecological research and conservation activities. The construction of the new field station was funded through a $15 million grant from the CONICYT, the Chilean equivalent of the U.S. National Science Foundation as well as funds from UNT. The grant will help support research for the next 10 years. Last year, UNT and the Universidad de Magallanes co-published a guidebook of the approximate 50 species of birds in Omora Park, including scientific and local knowledge of each species. Future projects include creating a similar guidebook for lichens, mosses and liverworts, known as the “Miniature Forests of Cape Horn,” and translating philosophy texts from Spanish to English and English to Spanish.